The American buffalo is really not a buffalo, but a bison. A true buffalo is either an African Cape Buffalo or an Asian Water Buffalo. The American bison's scientific name is Bison bison. Because our history has so ingrained in us the name 'buffalo', we still use it interchangeably with bison. The number of bison in North America in the early part of the 19th Century was incredible! Estimates range from 30 to 200 million with 60 million being the most widely accepted estimate. They were found as far east as the Potomac River and stretched from the Yukon to Florida. The 200,000 Native American Plains Indians were thought to harvest 2 million buffalo a year, a mere third of the bison's annual birth rate. They used every part of the buffalo. 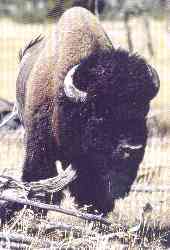 Even the dung (buffalo chips) were used as firewood. The rough side of the tongue was used as a hairbrush, the brains were used as a tanning agent, the bladder and stomach became water vessels, the horns were used as ceremonial dress as well as ladles and spoons. The bones became knives, paint brush handles and sewing awls. The hooves made glue and the tail made an 'all natural' flyswatter. The hides were used as tipi covers and robes. Nothing was wasted until the white man came along. As the white man progressed westward, the inevitable conflict grew between the two parties. The US Army was having quite a time controlling the Indians and Gen. Phillip Sheridan convinced President Grant that the only solution to the Indian problem was the continuation of what in part had caused it: the destruction of the bison. Instead of signing a bill to stop the slaughter, President Grant vetoed it. Gen. Sheridan praised the buffalo hunters by saying: "These men have done in the last two years…more to settle the vexed Indian question than the entire regular army has done in the last 30 years. They are destroying the Indian's commissary…and an army losing it base of supplies is placed at a great disadvantage. Send them powder and lead, if you will; but, for the sake of lasting peace, let them kill, skin and sell until the buffaloes are exterminated. Then your prairies can be covered with speckled cattle and the festive cowboy". Three other factors accounted for the demise of the buffalo: the iron horse, longhorn cattle and a new tanning method. Buffalo Bill Cody (left) had a contract to supply the Kansas and Pacific Railroad with 12 carcasses a day. Hardly enough to destroy the vast herds but the railroad knew how to generate business. They advertised 3-day buffalo excursions where 'hunters' could, for ten dollars, ride on the train and shoot buffalo from the window. Carcasses were left to rot in the prairie sun. The railroad also made it possible to ship staggering amounts of hides back east to tanneries. Longhorn cattle from Texas competed with the bison for prairie grazing. There was a great demand for meat, not only for the railroad crews but also for the eastern consumers. Once again the railroad facilitated the bison's demise by transporting live animals from the plains to the Kansas City stockyards and then carrying the carcasses back east. Cattle could be managed--bison could not. The bison had to make way for cattle. In 1870, Josiah Wright Mooar sent some raw buffalo hides to his brother, John, in New York, who sold them to a tannery. Satisfied with the outcome of a new tanning process, the tannery ordered 2,000 more for $3.00 each. This was the beginning of a large, but short lived, hide market. Buffalo robes became a fashion statement with most middle and upper income families having buffalo bedspreads, couch covers, buggy and sleigh lap robes. All British Army leather goods were made from buffalo leather exclusively for twenty years. At the same time, there had been a decimation of Argentine cattle hides, which supplied most of the major leather markets until 1870. Tom Nixon once shot 120 bison in 40 minutes, witnessed by a crowd he brought out from town and positioned on a hill so they could watch. He killed over 3200 bison in 35 days! In 1872, over 2 million were killed for just their hides. It is estimated that 31 million bison were killed between 1868 and 1881. By 1885, less than 500 buffalo survived. Finally, President Cleveland signed a bill protecting the vanishing bison. In 1872, Yellowstone National Park was established with a scraggly band of 21 bison populating the Park. Brooklyn zoo bison were exported back to the west. Through the efforts of the Federal Government, private ranchers and conservation groups the bison population has grown to over 350,000 today!